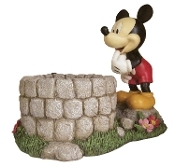 Durable polyresin outdoor planter of Micky Mouse. Fully painted in bright colors. Use as an accent piece anywhere in your yard or garden. Durable polyresin outdoor statue of Minnie Mouse and her parasol. Fully painted in bright colors. Perfect for any garden setting. You'll have lots of fun with this classic Minnie Mouse statue that actually waves to visitors. The hands are attached to the statue with wire so that they will move slightly in the breeze and passersby will think Minnie is waving to them. A fun statue that will delight the kids.